* Are you a creative bride? * Do you love vintage weddings? * Do you like to swoon over pretty things? * Do you want a glitzy vintage bridal day out? * Do you want to find unique wedding suppliers who can create a bespoke service just for you? 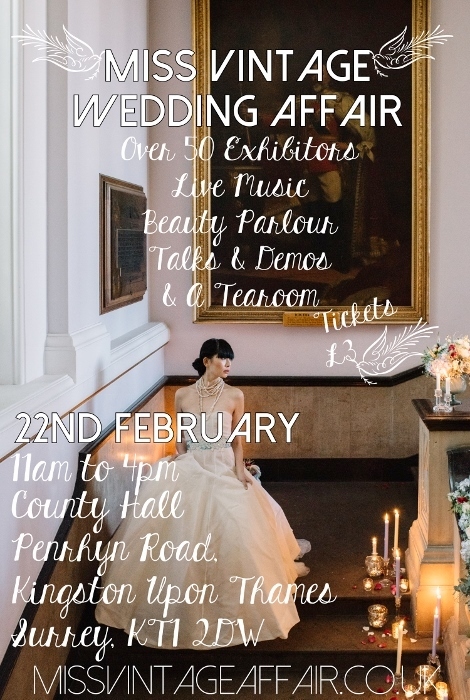 Taking place at the stunning County Hall in Kingston Upon Thames, Surrey on 22nd February, this wonderful bridal extravaganza will be just the thing for your wedding planning needs. This gorgeous Victorian building is grand in its design complete with arches, high ceilings and patterned floors and is the perfect setting for this glitzy wedding fair. It is clear that *Miss Vintage Wedding Affair* is not any kind of ordinary wedding fair – it is a spectacular showcase of exquisite wedding suppliers and is filled with vintage treasures and beautiful things. The first 400 brides will received goody bags filled with treats! Amelia has personally selected a divine range of unique wedding suppliers that could help to make your wedding day one to remember, including Peach and Jo Photography, Bee Smith Millinery, Gardenia of London, Federica Bruno Couture and Locke & Busby. And obviously many more! Wedding suppliers will be on hand to talk to you and a number of industry experts, including Amelia herself, will be giving talks. Various experts will also be doing demonstrations. There will be also be a pop-up vintage hair and make-up parlour hosted by Laura Loves. The idea behind the fair is to be relaxed and for couples to be able to experience first hand the wedding services that Amelia’s chosen wedding suppliers have to offer. The sparkle, glitz, glamour and prettiness shall wow you that is guaranteed! Featuring London’s largest selection of vintage, bespoke and ready to wear wedding dresses with the perfect accompaniments. There will be an array of musical treats as you browse, including The Candy Girls, Vintage DJ Mr Tunes and singer Nina Rae. Take a tea and cake stop to enjoy a delicious range of British classics or something scrumptious for lunch finished off with a glass of bubbles. The go-to for glitz and glamour, *Miss Vintage Wedding Affair* is absolutely not to be missed and should be the first bridal date in your new 2015 diaries/wedding planners! Amelia says: “Planning a wedding should be a fun experience, and Miss Vintage Wedding Fair is designed to be a fun day out, with delicious treats available and plenty of time to relax and chat to suppliers without feeling tired, hungry or pressured. We want our brides to feel at home and to get the most out of the day – to come away feeling energised and inspired. *Sparkle Pearls and Lace* is SO excited to attend – we have our tickets, do you have yours?! This looks amazing! Thanks for sending the information!